However, a statement one of the bidders made during public comments at the opening of the meeting ultimately resulted in a unanimous board vote directing staff to forget the bid process and, instead, initiate a new one with an Invitation to Negotiate process regarding the parcel. 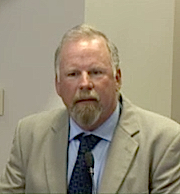 James F. Gabbert of TST Ventures LLC in Sarasota told the commission he had learned that a stormwater stipulation in his proposed $1.8-million bid for the land would not be feasible, so he was withdrawing the stipulation. He had asked staff about purchasing additional stormwater and floodplain credits linked to a stormwater pond on neighboring county property, but staff had told him those credits were linked to other projects, he pointed out. Still, he was the high bidder, he noted, and, “we’ve already had eight months” to undertake due diligence on the site. Therefore, he would just need the board’s approval of a rezoning and special exception application to build a recycling facility and a waste transfer station on the property. 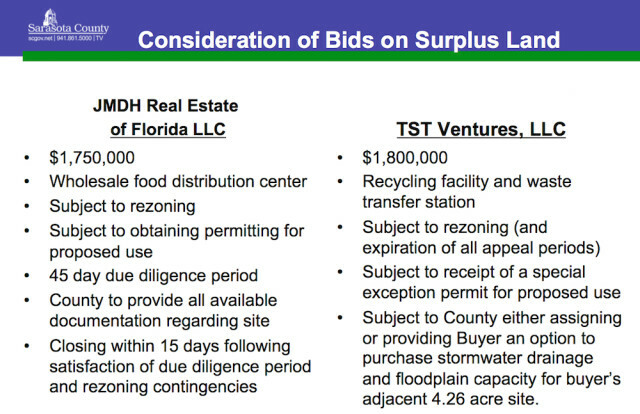 Nonetheless, staff recommended the bid be awarded to JMDH Real Estate of Florida, whose offer was for $1,750,000. Gerald Daws of JMDH — which is based in College Point, NY — said he was acting on behalf of Restaurant Depot, a national wholesaler of food, supplies and equipment, which has 120 stores across the United States, including 10 in Florida. An 11th location is under construction in Fort Myers, he added. For a little more than a year, Daws continued, he had been looking for a suitable site in Sarasota for a 65,000-square-foot facility that would provide about 60 permanent jobs. Based on averages reported by the existing Florida stores, Daws continued, the Sarasota store would be expected to generate gross sales tax revenue between $650,000 and $700,000 per year. Restaurant Depot already has 67 Sarasota customers who come to its Tampa store, he added; they spent $1.7 million there last year. “This is sad,” Commissioner Charles Hines said in seconding the motion, “because this is a piece of property that we want to get sold, get it on the tax rolls” and see it lead to new county jobs. “But I’m struggling with how maybe we and the staff prevent a bell being rung [in the future like the one] that occurred today,” he added, referring to Gabbert’s remarks. Reached later the same day by The Sarasota News Leader, Gabbert said he was not sure whether he would participate in the ITN process. “We’ll just have to see what they come up with,” he added. 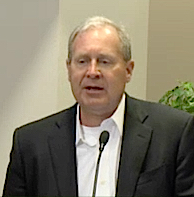 Daws declined comment when the News Leader spoke with him on March 24. In her March 22 presentation to the board, county Real Estate Right of Way Agent Cheri Ivarsson explained the facets of the two bids for the parcel, which is part of what staff and the board call the “Quads” at the intersection of Apex Road and Palmer Boulevard. The property was declared surplus in 1997, a staff memo notes, but the initial effort to sell it — which began in April 2015 — netted only two bids in six months, and neither met the county’s minimum of $1,750,000. After staff tried a second advertisement, starting in December 2015, it received the TST Ventures and JMDH Real Estate bids, the memo says. TST Ventures owns an adjacent, vacant 4.2-acre parcel, Ivarsson pointed out. That is located at 6150 Palmer Blvd., according to records in the Sarasota County Property Appraiser’s Office. The company purchased it in April 2015 for $100,000, those records show. 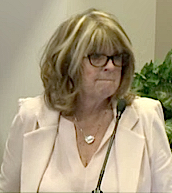 After Ivarsson completed her presentation, Robinson asked why she did not mention Gabbert’s willingness to withdraw the stormwater stipulation. Because this involved a sale by bid, Ivarsson responded, she understood that she had to present the offer exactly as it was submitted to the county, regardless of Gabbert’s comments that morning. “Is the provision possible at all?” Robinson asked of the condition regarding stormwater. Lin Kurant, manager of the county’s Real Estate Services Department, explained that the pond from which TST Ventures originally sought stormwater capacity was designed to serve that purpose for two additional phases of work on Cattlemen Road, which have been on hold. Commissioner Hines said it appeared clear from a statutory standpoint that the board had to include the stormwater contingency in its consideration, “even though it does make commonsense” to drop that. DeMarsh told him, “I believe that’s the best way to apply the concepts of ‘highest and best bid’ contained within the statute” in regard to the facts before the board. “I want to see the property sold,” Chair Al Maio said. 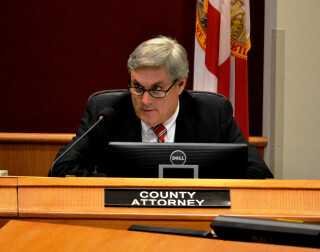 “I want the money,” especially as most of the proceeds would go to the county’s general fund. Then Robinson said she wanted to find out whether the contingency that was part of the TST Ventures bid even was possible. If it was not, she told her colleagues, the bid would be invalid. If it was possible, then the board could consider the offer. “That’s true,” Caragiulo concurred, adding, “My lack of comfort is coming from the $50,000 disparity in the public treasury,” referring to the difference in the amounts of the bids. Then Robinson asked Kurant why staff chose the bid process for the property. “I appreciate your honesty on that one,” Robinson responded. 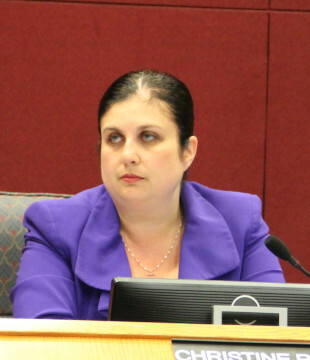 Finally, Molly Williams, the county’s stormwater manager arrived, apologizing because she inadvertently went to the county’s BOB building that morning instead of heading to the County Commission meeting in downtown Sarasota. On her way back downtown, she added a major traffic accident on Fruitville Road necessitated detours that delayed her return to the Administration Center on Ringling Boulevard. 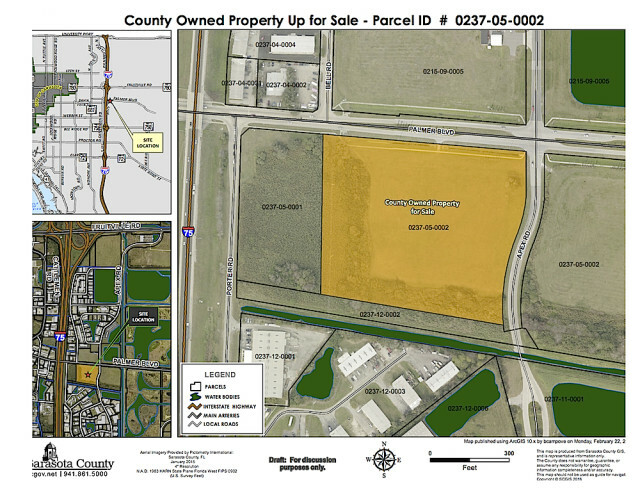 Robinson asked her whether it would be possible for TST Ventures to purchase stormwater credits linked to the pond on the county parcel to the northeast of the property that is for sale. Williams told the board she was not sure the stormwater pond on that other parcel could be enlarged adequately to serve the other three Quad sites, the two Cattlemen Road phases for which it has been reserved and the additional stormwater credits for TST Ventures. “I think there’s a possibility to expand that pond to provide the accommodations,” she said, but engineering studies have not been undertaken to prove that. Hines asked DeMarsh what would happen if the board approved the JMDH bid and then, after the company inspected the physical aspects of the property — as it specified in its offer it would do before closing on the sale — JMDH decided it did not want to buy the land after all. After DeMarsh’s response, Robinson made her motion. When Chair Maio called for the vote, it passed unanimously.